Seitan is a high-protein food made from wheat gluten. In a large ceramic or glass bowl, combine the flour, nutritional yeast and spices. Add the tamari or soy sauce and 3 1/2 cups of water. With a wooden spoon, begin mixing. When it gets too sticky, continue mixing with your hands. When it starts to come together, turn out onto a board or counter-top and begin kneading. Knead for 10-15 minutes until the dough no longer sticks to the counter-top and is like bread dough -- adding small amounts of flour if necessary. Roll into a ball and let it rest in the bowl for a few minutes. Meanwhile, prepare the cooking liquid. In a large stock pot with a lid, mix the vegetable stock powder, spices, tamari or soy sauce and four cups of water. Take the bowl with the dough to the sink. Fill the bowl with warm water and begin gently kneading the dough inside the bowl of water. Keep the water running and knead for 15-20 minutes until the water becomes clear. As you knead, do your best to keep the dough together. Cool the water as you go so that by the time the water is clear, you are using cold water. At that point, let the seitan sit in cold water for a few minutes so it firms up. After a few minutes, drain the seitan in a colander. Boil the seitan whole, in pieces or form into logs or patties. Add the seitan to the stock pot. Bring everything to a boil, lower the temperature, cover and simmer for 45-60 minutes. When it's done, turn off the heat and let it cool to room temperature. Drain the seitan. For a firmer texture, press out the water with the back of a spoon. Store in a sealed container, with or without the juices, for up to a week or freeze in airtight containers for a month or two. The spices can be any mixture you choose. Try onion, garlic and ginger for an Asian taste; basil, oregano, rosemary and sage for Italian; or garlic, cumin, cilantro and red pepper for Mexican. If you don't have vegetable stock powder, use your favorite pre-made stock from a carton. Use the simmering stock for soup. 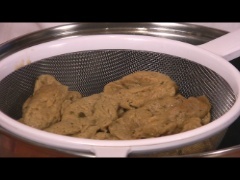 When washing the seitan, place the dough in a colander or seive 2 or 3 times during the process. Squeeze the dough and rinse to help remove a little more of the starch. You can also bake, steam, deep fry or saute the seitan instead of boiling it. Use seitan in stir fry, pasta dishes, simmer in gravy, smother with tomato sauce, bake in casseroles, and warm and add to sandwiches.